This Herb-Buttermilk Chicken will be a fast favorite for your summer grilling! Fresh herbs clinging to the chicken even on the grill and the Tomato-Basil Butter is the perfect touch of robust flavor to finish the chicken before serving. The intense heat of a grill can leave chicken breast rubbery and dry if it isn’t prepped with a marinade or brine and monitored closely for doneness. That’s where buttermilk and an instant-read thermometer come in. Buttermilk has been a secret ingredient in the best fried chicken for as long as I can remember, and it brings the magic to grilled chicken too. TIP: Another important step in prepping chicken breast for the grill is even thickness. Using a meat mallet, it should only take two or three whacks on the thicker end to create an even piece of meat that will cook, well, evenly. An instant-read thermometer like the ThermoPop is the best tool for knowing when it’s done to avoid overcooking. Grilled chicken is a standard make-ahead protein at our house and this recipe is easy to double or triple. As delicate as chicken breast can be during the cooking process, it is remarkably resilient when frozen. Both the chicken and the compound butter freeze well and are suitable for numerous recipes. I love having it on hand for quick dinners when time is tight or I’m just tired of cooking. The Herb-Buttermilk flavored breast is an ideal topper for salads, pasta, pizza, or burritos and you can use the Tomato-Basil Compound Butter to add rich flavor to any dish. You can even use it to make a quick sauce, like this Tomato-Basil Grilled Salmon. A simple marinade of buttermilk and herbs makes chicken tender and delicious when grilled. The tomato-basil butter is a superb finishing touch. Place one chicken breast inside a food storage bag or under plastic wrap and pound the thicker part of the breast with the flat side of a meat mallet or large skillet to flatten. The chicken will cook evenly when it is an even thickness. Whisk together the marinade ingredients in a medium bowl and transfer to a large resealable plastic bag. Add the chicken, making sure the marinade surrounds each piece, seal the bag and refrigerate for 1 to 4 hours. Set the butter for the compound butter out on the counter to soften to room temp. When ready to grill, start with the tomatoes for the compound butter. Remove chicken from marinade and transfer to a platter while preparing the butter. Heat the grill to 400°F. Toss the tomatoes with 1 tablespoon of the oil to coat and place on skewers, or use a vegetable grill pan. If using a grill pan, place on the grill while preheating so it is hot when the tomatoes go on it. Grill the tomatoes until blistered and charred in places, about 8 minutes. Remove from grill and transfer to a cutting board. Sprinkle with salt and pepper and coarsely chop. Transfer to a mixing bowl and place in the refrigerator for 5-10 minutes to cool. Combine with the remaining 2 tablespoons of olive oil, basil, and softened butter until well mixed. Spoon compound butter onto a piece of wax paper in a long, narrow shape, about 2 inches wide by 9 inches long. Turn one side or one burner of the grill off to create an indirect heat zone (adjust the other burners to maintain the temperature around 400°F). Place the chicken on the indirect side and close the lid. Allow to cook for 4-6 minutes on each side, or until the internal temperature of the chicken is at least 130°F. Move the chicken to directly over the heat to create grill marks and finish cooking, about 2 more minutes per side. Remove from grill when the internal temperature of the thickest part is between 153-155°F and tent loosely with foil to rest for 5 minutes. butter should melt over the chicken. If the butter is still not melted when the chicken is done resting, place in a warm oven for a couple of minutes until ready to serve. 1. Prep time includes marinating time. 2. Tomato Basil Compound Butter can be made well in advance and refrigerated until ready to use, for up to 2 weeks. This recipe will only require about half of the butter made, the remaining butter can be stored in the freezer for other uses such as topping grilled or roasted meats, spread for breads (allow to soften), or a starter for pan sauces. This is perfect! Really love this grilled herb buttermilk. I’d like to try this at home. Looks yum and flavorful! I can taste it! Urgh! 🙂 Thanks for sharing the recipe. Yum, this recipe is perfect! Living in Florida now, it is grilling season all year and this sounds like a good recipe to have in my files. 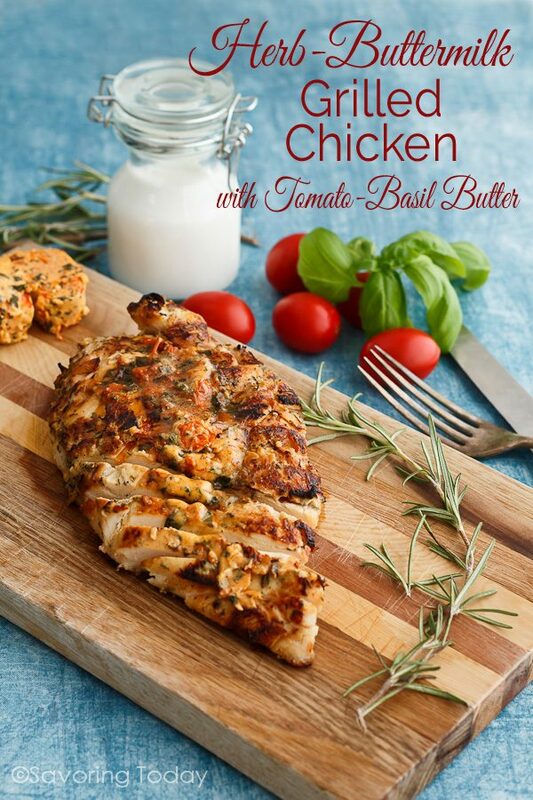 GRILLED HERB-BUTTERMILK CHICKEN WITH TOMATO-BASIL BUTTER is an excellent recipe and healthy food also. Let’s try it! Grilled chicken is something we have often. And you’re right — whacking the thick part to flatten it a bit sure does make for a more evenly-cooked chicken. Need to try the buttermilk marinade — that sounds wonderful. Thanks! Simple yet so flavorful. I love it. I’ll be adding this recipe to my list of healthy lunches. I like how it’s lean and grilled. Hi Marjorie, thanks for stopping by to let me know you’ll be trying the recipe. 🙂 I’d love to hear how you liked it when you do!